The dialer range includes the GSM Auto Dialer, PSTN Auto Dialer and PSTN Voice Dialer. Their AD06 GSM Speech and Text Auto Dialer offers a complete solution for GSM notification needs and can be controlled locally via a keypad or remotely using the app. The AD01 PSTN Voice Dialer can be programmed with up to 9 user telephone numbers to alert of intrusions or other emergencies. 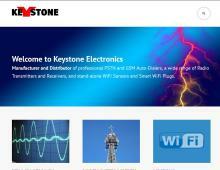 Keystone Electronics have a strong customer base in the UK, Europe, USA, Africa and Australasia, manufacturing and distributing WiFi sensors from their UK warehouse. Their WiFi component range includes the WiFi security camera, WiFi temperature sensor, WiFi Plug, WiFi motion sensor, WiFi shock sensor and Wifi door / window sensor. The stand-alone WiFi Plug (Smart Plug) allows the user to remotely control the actions using a free smart phone APP, the same APP allows the WiFi sensors to receive an alarm signal once activated. If you are looking for a WiFi sensor, 433.92 or 868 MHz transmitter and receiver or auto dialler contact Keystone Electronics for more information.